The Peffery Way | Windfall from local Wind Farm! 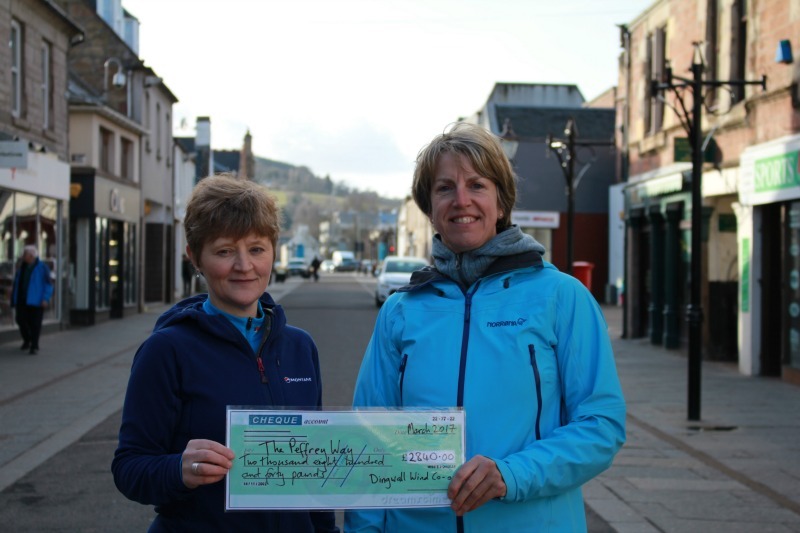 The Peffery Way cycle path from Dingwall to Strathpeffer has been awarded £2840 from Dingwall Wind Co-op in their first round of community funding. This award will go towards building the path and erecting gates, fences and signage. Nessa Findlay of the Peffery Way Association commented; “This is excellent news. This money will help us build the path over the next year. We will work with landowners to provide a safe and appropriate path through our beautiful countryside”. Kerry Sinclair Director of Dingwall Wind Co-op said “Our members voted to put community funding towards improving access to the countryside. Applications are now open for groups to apply for funding with the deadline 31 May 2017”. The Peffery Way Association is currently looking for a couple of trustees to join the organisation. Come along for the first Annual Members meeting on Wednesday 5th April in Dingwall Academy at 7.00pm. The meeting will start with a talk from a guest speaker about exercise, getting out and improving your health, followed by the formal members review. The next steps for the project are to start to work towards securing additional funding for the various phases of the route. The Association will create a safe route for cyclists and walkers whilst respecting the needs and livelihoods of farmers and crofters.